ATHENS, Ga.-Today was the last day for all of UGA’s NFL Draft-eligible football players to join together and prove themselves to NFL head coaches, coordinators, scouts, and executives. Twenty players, mostly seniors, went through measurements and drills in the weight room and on the practice field in order to state their cases to be selected higher in April’s draft. 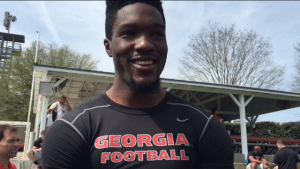 For some Bulldogs like running back Keith Marshall and linebacker Leonard Floyd (pictured), today’s Pro Day gave them a chance to build on their strong performances in the combine, where they impressed in strength and speed drills as well as those specific to their positions. After running his 40-yard dash in a blazing 4.31 seconds and leading all running backs in bench press repetitions at the combine, Marshall chose not to participate in those events today. He did, however, go through the running back drills. “I think it’s picked up a lot, with the whole process, you know, a little more exposure,” Marshall said of Pro Day’s impact. Floyd took a similarly selective approach, putting up a 35-inch vertical jump in addition to a participating in agility drills. On the other hand, linebacker Jake Ganus took advantage of his first opportunity to perform in front of a variety of coaches and scouts after not being invited to the combine in February. Ganus ran a 4.77 40, recorded a 9-foot 5-inch broad jump and 30.5-inch vertical leap, and bench pressed 225 pounds 15 times. He also participated in the linebacker drills. The Atlanta Falcons’ Dan Quinn, New England Patriots’ Bill Belichick, and Buffalo Bills’ Rex Ryan were among the NFL head coaches who attended the Pro Day. Falcons General Manager Thomas Dimitroff was present, as was former UGA Offensive Coordinator Brian Schottenheimer, now with the Indianapolis Colts. All 32 NFL teams had personnel evaluators in attendance. 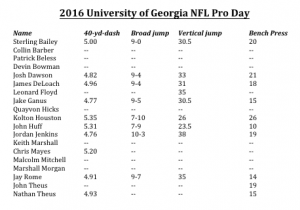 Check out how all of UGA’s players did in the measurable events today on the table above, courtesy of UGA Sports Communications.